An underground walkway from Gokongwei Hall to the Br. Andrew Gonzales Building will soon be under construction, starting April 31, 2018, with a projected date of completion on February 29, 2019. According to Vice Chancellor for Campus Development Josemari Calleja, the project head of the new facility, DLSU is the first university in Manila to open an underground walkway. Though the walkway’s construction has yet to commence, the University has already set rules for the use of the underground walkway. Calleja said that during his meeting with University Chancellor Dr. Robert Roleda, they developed a set of guidelines for the proper use of the new facility. Calleja explains that the underground walkway is only open for DLSU students, faculty, and staff. He also adds that Senior High School (SHS) students are not allowed to pass through the underground walkway because of overpopulation concerns. “The underground walkway is meant for more efficient access to the other side of the University, so I’m afraid that it will be limited to a number of people,” Calleja elaborates. He also outlines another important guideline, since there is already an alternative walkway, being late to class is strictly prohibited. Once you are late to class, you are automatically absent. 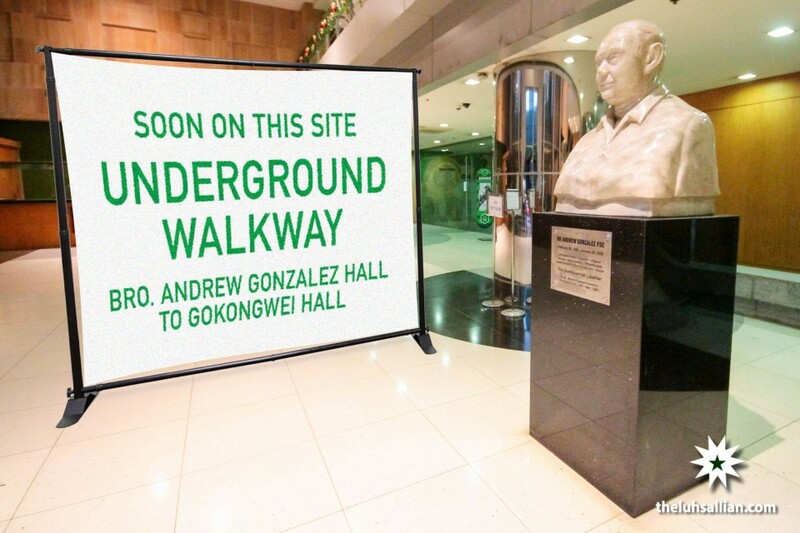 The underground walkway shall be constructed near the Taft side entrance of Gokongwei Hall. Moreover, the look of the walkway will be similar to underpasses in Ayala’s Central Business District where art covers the walls and ceilings of the underpasses. “What we plan to construct is similar to the underground walkways in Ayala where murals are placed in the walkway. We thought of showcasing the history of DLSU in the underground walkway so that Lasallians could be more aware of the rich history that we have.” Calleja states. Makati Development Corporation has been chosen by the Campus Development Office to construct the underground walkway. In addition, the cut and cover method will be done for construction of the said walkway. With the construction of the underground walkway, students are highly encouraged to pass near the Agno gate to enter Gokongwei Hall to avoid being disturbed with the construction of the underground walkway. Even if the construction is ongoing, the Campus Development Office and the Makati Development Corporation promise that it will not disrupt the classes and people who stay in the Gokongwei lobby. The construction of the walkway will be done in three phases. Ana Batou (II, AB-OCM) expressed her excitement, saying that she cannot wait for the underground walkway to be accessible. “It will be a great help to the Lasallian community,” she said. Meanwhile, Mark Tiu (II, AB-LIM) says that going to Andrew Building will be hassle free with the construction of the underground walkway. “Traveling to the Andrew Building from Agno gate is a hassle due to the number of cars who pass by. The amount of people who also pass by that place makes it a super hassle. I think it is a good idea since people can have more choices as to how they could go to Andrew and it wouldn’t be a hassle anymore since there is a safer and a more efficient way to reach Andrew.” he expounds. However, not all students agree with the construction of the underground walkway. Jessica Chang (III, BS-ENT) said, “I think the underground construction is a waste of expenses, effort, and time. I wish that the University addressed other concerns first.” Yna Marquez (Grade 11, ABM) finds it unfair how they are not permitted to use the walkway. “How come SHS students aren’t allowed to use the underground walkway? They could have at least given us a reasonable explanation as to why this rule is implemented. I find it unfair that the administration decided to implement this rule since we are also one of the few reasons as to why this school survived during the lean years,” she insists.